"Gonpachi Komurasaki" was premiered in the 1st lunar month of 1816 in Edo at the Nakamuraza as the first and second acts of the nibanme of the sogamono "Hiyoku no Chô Haru no Soga Giku" [more details]. This new year drama mixed two sekai: it was a sogamono and a gonpachi-komurasakimono. "Gonjô" is the nickname of the first act. Gon came from Gonpachi, the first name of the hero. Jô came from ue no maki, which means the upper (ue; jô is another possible reading) volume (maki), aka the first act. The accompanying music, performed in the Kiyomoto style, became famous and its own title, "Sono Kouta Yume mo Yoshiwara", quickly became the title of these two acts, which were kept in the Kabuki repertoire. The others acts related to the vendetta of the Soga brothers fell into oblivion. It is night at the notorious Suzu-ga-Mori execution ground in Edo. Two officials are discussing the imminent arrival of a young rônin named Shirai Gonpachi, who has been sentenced to death for murder and theft. He has turned to crime to pay for his visits to the courtesan Miuraya Komurasaki in the Shin-Yoshiwara pleasure quarter (kuruwa) of Edo. The officials make their way to the place of execution together with the leader of the beggars and outcasts (hinin) who will attend as usual the execution. The Kiyomoto musicians describe Shirai Gonpachi and the difference between the fine figure parading in the pleasure quarter and his current situation as he is led in mounted on an unsaddled horse with his arms bound. Gonpachi dismounts and an official reads out the list of crimes for which the youth has been sentenced to death. Gonpachi, who has kneeled on the execution mat, is asked if there is anything he wishes to say. He addresses the assembled mob, officials and hinin, making an eloquent confession and admitting that lust and greed were the root causes of his downfall. The death sentence is about to be carried out when Gonpachi's lover, Miuraya Komurasaki, comes running down the hanamichi. She begs to be allowed to bid her lover farewell and drink a final toast. As it is out of question to bring any sake, the toast will be in water. The officials reluctantly agree but when Gonpachi has just drunk the water, Komurasaki suddenly produces a knife and cuts the rope that binds him. 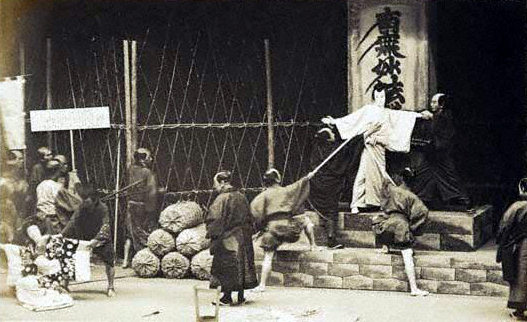 Gonpachi has just arrived at the Nakanochô inside the Shin-Yoshiwara in a palanquin (kago) and, having fallen asleep on the way, the kagokaki call to him. He difficultly awakes. He had a terrible nightmare. He has just dreamt his death; the previous scene was just a very bad dream. In the meantime Komurasaki has been waiting impatiently for her lover's arrival, and a whole cortege including the Miuraya courtesans, shinzô and taiko mochi come to greet him. Amid the company is Umeno, the shinzô serving Komurasaki, who has brought a letter from Komurasaki for Gonpachi. She gives him the letter and then ties her obi to Gonpachi, saying that Komurasaki had told her to do so, in order that she may be sure that Gonpachi will come to visit her. Gonpachi goes off with the lively company, but he still can't shake off the gloom and can't get rid of a strange sense of foreboding coming from this very bad dream. The title "That Song and a Dream of Yoshiwara" comes from Samuel Leiter's "Historical Dictionary of Japanese Traditional Theatre".